Illinois State University’s Mennonite College of Nursing (MCN) welcomed several Russian visitors from Vladimir Medical College for a two-week visit in October. Vladimir Medical College faculty members Olga Antropova, Natalia Ushakova, and Nina Bedova and students Grigorii Antropov and Vera Rybina arrived Saturday, October 19, in the United States. 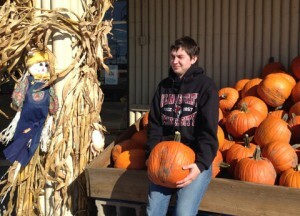 They were able to relax on Sunday before arriving on campus Monday morning. They started their visit with a tour of Illinois State’s beautiful campus, and then met with nursing librarian Diane Mather to tour Milner Library. They were given a tour of the Nursing Simulation Lab (NSL) and were able to observe MCN students in the skills lab. They also attended several nursing classes and were able to go back to the NSL for their own hands-on lab time. MCN’s transcultural coordinator, Melissa Moody, and Transcultural Faculty Director Lynn Kennell were instrumental in developing the agenda for the Russian visitors. They not only wanted MCN’s visitors to experience all of the wonderful opportunities on campus but also wanted them to visit various organizations off campus as well. They went to the McLean County Health Department and met with MCN alum Sue Albee, B.S.N. ’95. She gave them a tour of the various clinics at the Health Department. Kennell gave them a tour of OSF St. Joseph Medical Center’s birthing center. They then went to the OSF Clinic on College Avenue where they were given a tour through the Center for Advanced Medicine. 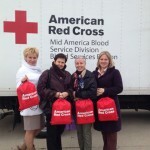 They also visited the Red Cross and observed a blood drive, and toured Advocate BroMenn Medical Center. Kennell also drove them to Peoria to tour various departments at OSF St. Francis Medical Center and Children’s Hospital of Illinois. 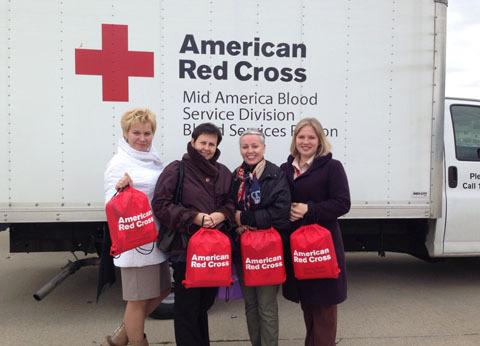 The faculty and students visited the American Red Cross. MCN’s guests had the opportunity to visit some impressive areas of campus. University Galleries provided a tour of its gallery and exhibits. The School of Kinesiology and Recreation gave our visitors tours of its Biomechanics Lab, Campus Recreation, and the Athletics Training Lab. They also attended an electrocardiogram (EKG) class with Instructional Assistant Professor Karen Dennis, B.S.N. ’89, M.S. ’99, M.S. ’00, Ed.D. ’11. Associate Professor Mary Dyck’s home, visits with community friends of MCN, a walk around the Ewing Cultural Center, and visits to East Peoria’s Bass Pro Shop and Peoria’s Grand View Drive, and shopping at various Bloomington-Normal shopping centers. The Student Nurses Association hosted a potluck in honor of the visitors and took them to Rader Family Farms to pick out pumpkins and carve them. MCN faculty and staff also took them to Springfield to visit the Lincoln Museum, and to Chicago.